Everyone will be in the mood to celebrate either a baby shower or birthday when they are wearing a Woodland Creatures mini party hat. This set of 10 party accessories is a great addition to your event and is sure to get everyone smiling! Each Woodland Creatures small party hat is perfectly themed and has a festive star at the top. Be sure to have your camera ready because these mini party hats are going to give you some great baby shower or birthday photos! Woodland Creatures Mini Party Hats INCLUDES 10 Woodland Creatures party hats with elastic chin straps. Mini baby shower or birthday party hats will fit both children and adults. 10 Woodland Creatures party hats SIZE 4.5 inches tall and 3 inches in diameter at the base. The included elastic chin straps measure 12 inches long. 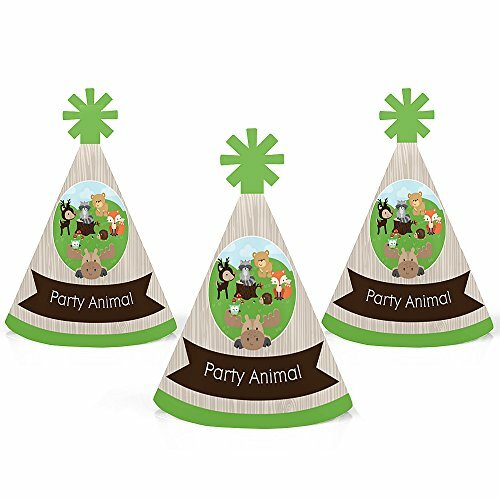 These cute forest friends party accessories feature a unique star cut-out decoration at the top and the printed saying "Party Animal". FUN WOODLAND PARTY ACCESSORIES: Woodland Creatures mini party hats are perfect for your forest friends party. This set of cute tiny party hats will help you take adorable baby shower or birthday photos. Best of all, mini party hats are perfectly sized for adults, kids, and even pets, so everyone can get in on the photo fun. Little party hats are sure to be enjoyed by all your friends and family! PREMIUM MINI PARTY HATS: Set of 10 Woodland Creatures mini party hats are professionally printed on heavy-duty card stock paper with a photo-like shine. They are individually inspected, then carefully packaged. Woodland Creatures mini cone baby shower or birthday party hats will arrive flat, with the chin straps attached. Easy assembly is required. Simply roll the party hat into a cone shape and slide the tab into the slot to secure. MADE IN THE USA: Woodland Creatures - Mini Cone Baby Shower or Birthday Party Hats are designed and manufactured at our Wisconsin facility using materials that are Made in the USA.